6.0 x 3.8 x 2.7 cm. 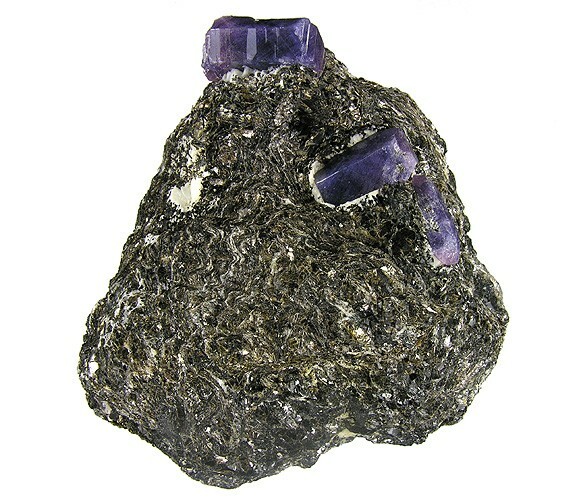 For both size and quality, this is one of the very best examples of the recently found Corundum specimens from Madagascar. I obtained it directly from Dr. Federico Pezzotta who collected it while doing research there. 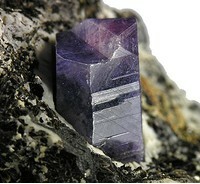 It features several fine, sharp, lustrous, prismatic, hexagonal crystals of a bluish-purple color (with slight pink zones) measuring up to 2.2 cm long perched on schist matrix. Some of these specimens show an obvious color change from indoor lighting to sunlight, but this change is minimal in this piece.